Founded in 1986 by two mechanical engineers, Jim Hogan and Tony Menard, VMAC began as a small machine shop designing disposable jet engines for the military. 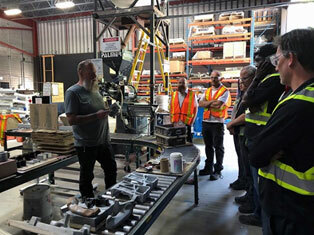 After the project ended, the company transitioned to a different niche, designing and manufacturing brackets for truck mounted air compressors. VMAC’s brackets quickly earned a global reputation for quality and durability. Later in the 1990s VMAC used this reputation to springboard into manufacturing complete air compressor systems for the service truck industry. Over the past 32 years, VMAC has grown to be one of the only true rotary screw air compressor manufacturers in the world. Steeped in a culture of innovation, VMAC is known for being the Leader in Compressed Air Innovation®. 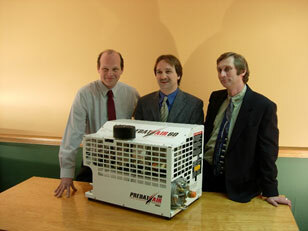 The story of modern day VMAC starts in 1997, when VMAC released the innovative UNDERHOOD™ 70 Air Compressor. This was the first time a rotary screw air compressor was mounted in the engine compartment of a truck. This state-of-the-art air compressor was a game changer, billed as “half the size and twice the output” of competing products. From then on, VMAC became known as the manufacturer of UNDERHOOD™ air compressors. Jumping ahead to 2002, VMAC pushed the boundaries again, releasing the innovative and powerful UNDERHOOD™ 150 Air Compressor. VMAC was the first to design and manufacture a rotary screw air compressor that mounted in the engine compartment and was capable of producing up to 150 CFM. 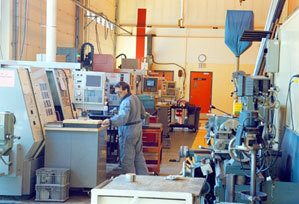 Then in 2004 VMAC became the true in-house manufacturer that it is today, when it began manufacturing its own proprietary rotors for its screw compressors. To this day, VMAC is still one of the only rotor manufacturers in world. Just one year later, in 2005, VMAC, released the H60 Hydraulic Driven Air Compressor designed to be mounted on the service truck deck. This air compressor was originally named the VMAC PREDATAIR and offered customers hydraulic air compressor system benefits that had not been previously available—the VMAC H60 was and still is less than half the size, half the weight, but with all the power of competitive products. This was followed in 2008 with the launch of a second PREDATAIR, the VMAC H40 Hydraulic Driven Air Compressor with intelligent digital controls. The VMAC H40 is up to 260 lbs lighter and 6 cubic feet smaller than competitive products, making it the smartest, smallest, and most powerful 40 CFM mobile hydraulic air compressor available. After releasing the H60 and H40, VMAC received demand from customers, dealers and truck body builders alike, looking for more choice in standalone deck-mounted air compressors. This led to the 2011 launch of the D60 Diesel Engine Driven Air Compressor, originally named the RAPTAIR. In addition to being more compact and lightweight than comparable 60 CFM diesel engine air compressors, the VMAC D60 features innovative engine anti-idling technology. The D60’s state-of-the-art advanced control system automatically shuts the compressor engine down when no air is being used, and automatically restarts the engine when air is needed. This VMAC anti-idling technology allows customers to save fuel, decrease emissions and maintenance costs, and extend truck and equipment life. Just two years later, in 2013, VMAC expanded its RAPTAIR product line even further to include the VMAC RAPTAIR-MF, now called the Multifunction Power System. The VMAC Multifunction Power System offers over 2000 possible configurations, weighs 400 lbs less than competing multi-power systems, and is equipped with VMAC’s advanced digital controls and anti-idling technology found in the D60. Then in 2015, VMAC—with significant input from its key industry body builder partners—developed and released the UNDERHOOD-Lite, later called the UNDERHOOD™ 30 Air Compressor, which is the only air compressor system specifically engineered for commercial vans. This version of the UNDERHOOD™ air compressor presented a desirable option for both customers and van upfitters—no longer do they have to settle for a diesel or gas air compressor in the back of their van, which not only takes up precious space for storing tools and other equipment, but is heavy, and exposes operators to toxic fumes and explosion risks. In the same year, VMAC also designed the G30 Gas Engine Driven Air Compressor, which was 50% smaller, 50% lighter, and 50% more powerful than competitive reciprocating compressor products. The G30 addition to the VMAC product line completed the deck-mount air compressor suite, which consists of the G30 Gas Engine Driven Air Compressor, the H40 and H60 Hydraulic Driven Air Compressors, the D60 Diesel Engine Driven Air Compressor, and the Multifunction Power System. 2016 was a big year for VMAC, with two notable events: another new innovative product release coupled with a major facility expansion. VMAC launched the VMAC DTM70 Direct-Transmission™ Mounted Air Compressor. This first-to-market direct-transmission mounted PTO driven air compressor is a 70 CFM air compressor that allows customers to reduce truck GVW by up to 260 lbs. Its underdeck positioning frees up to 25 cubic feet on the truck deck. Later that same year, VMAC poured the first casting in its new in-house foundry, which allows VMAC to expedite R&D innovations, and reduce time to market for new products. In 2017, VMAC updated the VMAC G30 Gas Engine Driven Air Compressor with the addition of the Honda GX390 engine. VMAC continues to innovate this version of the G30, as it is 23% quieter at high idle, 75% quieter at low idle, offers 15% better fuel economy, and has improved operational performance in hot temperatures and at higher elevations. The VMAC G30 remains the most affordable gas driven rotary screw air compressor available. 2018 was another a busy year of innovation with the release of the DTM70-H, UNDERHOOD™ 40, and CAT-powered Multifunction. The VMAC DTM70-H is a direct-transmission mounted multi-power system that combines continuous duty compressed air and hydraulic power all in one complete, compact, and easy to install system. This innovative product provides work truck owners and fleets with up to 70 CFM of compressed air, and enough hydraulic power to run a crane or other tools. The DTM70-H installs 30% faster than competitive deck-mounted hydraulic air systems, requires no drive shaft or transfer case modifications, and frees up truck GVW by as much as 600 lbs. With this latest innovation, the VMAC DTM70-H will become the industry standard for underdeck hydraulic air systems. The UNDERHOOD™ 40 Van Series Air Compressor replaced the UNDERHOOD™ 30 Van Series and provides customers with even more power. The UNDERHOOD™ 40 weighs just 14 lbs, provides up to 40 CFM at 100% duty cycle, reduces truck GVW by up to 290 lbs, and frees up to 10 cubic feet of cargo space. The UNDERHOOD™ 40 Air Compressor remains the only air compressor specifically engineered for commercial vans and is the industry’s first choice for performance, safety, and installation. The VMAC Multifunction Power System, powered by CAT, is a new addition to the line of VMAC Multifunction Power Systems, offering customers more choice. Customers will be able to choose a CAT engine with the VMAC Oilman Series Multifunction Power System, which continues to be hundreds of pounds lighter than competing systems. In early 2019, VMAC released a 24V version of its hydraulic air compressor, specifically built for OEMs. VMAC also began a series of new innovations: increasing the air output of the DTM70-H, creating a cab climate control HVAC system, releasing a DTM70 for RAM trucks, and more (to be announced)! It is this history of invention, and a commitment to the future of innovation, that led VMAC to launch its new brand: Air Innovated®. Air Innovated® is a promise to our dealers and our customers that VMAC will continue to prove itself as the Leader in Compressed Air Innovation®. Even after a busy few years with some major product releases, VMAC is not willing to sit back on its laurels, coast on past achievements, and take a break from designing, engineering, and innovating. We are driven by these past successes and our ongoing purpose is to carry forward the innovative spirit established by our founders through our products, the superior customer service emphasized in our every relationship, and the family values core to how we do business every day. Looking to the future beyond 2019, VMAC remains committed to maintaining its position as the Leader in Compressed Air Innovation® for the service truck industry. With complete in-house control of our product design, engineering, and manufacturing in North America, VMAC will continue to work with our customers and industry partners to develop and release new products and innovations that empower our customers to work more efficiently, sustainably, and profitably. 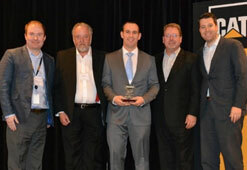 Following VMAC’s re-branding announcement to Air Innovated® at the 2018 NTEA Work Truck Show in March, VMAC received Finning’s prestigious 2017 Innovative Solutions Supplier of the Year award. Finning International Inc is the world’s largest Caterpillar dealer, with locations in Canada, Europe, and South America. For the last 20 years, VMAC has supplied Finning with UNDERHOOD™ air compressors used on their service truck fleet, and more recently VMAC began supplying Multifunction Power Systems, which operate in the harshest Northern climates. Finning uses the VMAC Multifunction Oilman Series Power System which combines an air compressor, generator, welder, battery booster/charger, hydraulic pump, and Positive Air Shutoff System (PASS) all in one complete package powered by a small diesel engine.